My first two novels, Double or Nothing and Skud, were inspired by my plays Chasing the Money and War. In both cases, I had become enamored of the characters in the plays and thought that a novel would give me a much larger canvas to explore the players, events and themes. 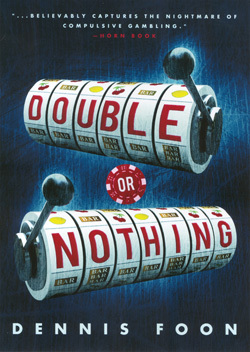 Double or Nothing is about Kip, seventeen, with an addiction to gambling that takes him to the edge of the precipice. On his way he meets a magician’s daughter…and her dad. Kip finds he has more in common with the father than the daughter would like. To me this book is ultimately about the cost of dishonesty. Being a master at lying, Kip is actually a pretty engaging fellow. But one little lie can snowball into a web of lies that can suffocate you and those closest to you. The choices you make at that point will often determine your future. Which is why I wrote this book: characters grappling with their demons have always fascinated me. Annick Press wanted to release a new edition of the novel, so I’ve done some revisions/updates and it has a very nice new cover: Click here.